Fredrik: Very good! It’s early morning for me, and I’m drinking a cup of coffee! MI: I bet you’re excited for warm and sunny Australia then? Fredrik: Sounds a lot better than the weather in Stockholm. We’ve had a lot of snow but it melted and got cold again. You can almost ice skate on the street! We went skiing for a bit when the good snow was here but we’re looking forward to the heat. MI: Australia loves Opeth and how often you spoil us with tours. How is the band feeling about doing something special and playing the Opera House? Has anyone in Opeth had a chance to suss out the venue? Fredrik: We’re very excited to play the opera house! From what I know no metal band has played there before which is something new for us, although we are a prog band now. We are going to do the special Evening of Sorcery, Damnation and Deliverance setlist like we did in London and in New York. It’s a three-hour long setlist with a basic Sorceress and back catalogue set, followed by a compilation of Damation & Deliverance songs. There’s a few songs we’ve never played live in that set, and playing new songs like that is fun for us and hopefully fun for the crowd. We’re also doing two shows in Melbourne, and I believe we’ll be changing up the setlist on the second night. MI: Without using the “g” word (growls), could you tell us about some of the changes this time around for Sorceress? Was there a sense of aggression within the band when this was tracked? Fredrik: Before we arrived at the studio we had a meeting and decided we wanted bigger, more meatier drums on Sorceress, and chunkier guitars. Initially we talked about doing a doomier album, and although it didn’t turn out that way some of the sections were a bit doomy. We didn’t necessarily want to go back to the earlier styles but we wanted it to be heavier in a different way. It’s important for us, especially for Mikael as the main writer, to do new and fresh things on every album. MI: How is the chemistry within Opeth now this latest lineup has been stable for a few records? And is touring with Axe (Martin Axenrot) as crazy as Mikael makes out? Fredrik: Axe is fun to tour with because he never stagnates and always comes up with new and funny ideas. It’s not that he acts funny but more that funny things happen around him. Lamps tend to explode around him and he was hit by lightning once. Maybe he affects electricity? He also drops his phone a lot. He’s a brilliant drummer, and a really fun guy to hang out with. MI: In particular, the chemistry can be heard on Sorceress in the outro solos to Chrysalis where yourself and Joakim trade off riffs, was that a planned part or something spontaneous? Fredrik: Mike asked me down to the rehearsal space, a little demo studio where we write music, and he wanted me to play a solo for that one, but he wasn’t sure if he wanted me to play the whole solo or if there would be an organ trade-off. So, the idea kind of came in there, and I did my two sections there and Joakim did his in the studio. It was good fun, I really enjoy stuff like that, and we’ve never had a duel like that before, and the heavy 70’s shuffle beat really made it great to play. MI: Your playing between bands like Opeth and your work in Arch Enemy who are more traditional death metal really varies and shows diversity but one question I have always wanted to ask you is how you manage to play chords and scales in major modes that sound so evil and dark, especially on cuts like Heir Apparent or The Devil’s Orchard? Fredrik: If you want to talk guitar talk, it’s referred to as the Phrygian Dominant mode, and I love learning things like that while I’m at home guitar nerding. I think though, during that album, Watershed, Mikael wrote a lot of those songs and discovered that around then, I don’t think he used it much on previous albums. He had a few new ideas, with that major sounding Phrygian mode. I was familiar with it too, like for instance Gates of Babylon (by Rainbow) used that same mode. It was blended in with the Augmented modes too though, and it’s always interesting to play with Mike because he always plays these mixes of scales that have great feel to them. MI: In the past, Mikael has said he doesn’t have a great knowledge of classical theory and prefers to play by ear whereas you are a technical and theory-trained guitarist, how does that dynamic work together when you write songs? Fredrik: I think it’s a good thing to not overthink when you come up with ideas. I still learn scales and practice them but I think that is indulgent, and I don’t necessarily use them when I play. Sometimes you just want to play with a blank mind. I think Mikael comes up with a lot of ideas like that too, where he’ll show me new chords that he comes up with and it’s usually whatever sounds good to his ear. I think you can come up with more originality when you approach it like that. I like a combination of both. MI: For the Evenings of Damnation, Deliverance and Sorcery you would have learnt songs off Damnation and Deliverance for the first time along with the band, what is the process of going back and learning Peter Lindgren’s parts like considering how differently you approach playing guitar? Fredrik: Very interesting! I’ve played most of the songs other than a few off Orchid and Morningrise. On this last tour, I had to learn a song we’ve never played live before, called By The Pain I See In Others, which is great fun to play live. When I went to learn it though I did think “how the hell did you come up with all these riffs?”! It was very differently arranged back in those days; more riffs, more parts, more information. Although, a few songs now are written like that; some of them are more demanding to play like the song River (from Pale Communion), similar to the past writing style but in a different way. Songs from the really old albums like Advent (from Morningrise) sound amazing with the current lineup, and they come across really well live. Peter (Lindgren) also wrote solos very interestingly; I can tell he looked at different modes and scales a lot, whereas I’m more of an improviser. He definitely had his own approach and I can appreciate it. MI: When you compare solos of yours like Heir Apparent that are blisteringly fast to solos like River and Will-O-The-Wisp which have a relaxed vibe to them, almost David Gilmour like, do you find it hard to divide the two mindsets for soloing? Fredrik: I mainly think about what the song needs. I really try and focus on having solos that are tasteful for each song. Sometimes I feel like going crazy and just shredding but I tried to put something else into the songs, with some melodic shapes that tie the songs together. I guess it really depends on what type of song it is. Especially for Will-O-The-Wisp I wanted a David Gilmour vibe. I love players like Gilmour and (Jeff) Beck who play with a lot of feeling, but as well as that the tone is the most important thing. When I started out as a kid watching Paul Gilbert dvds I wanted to pick as fast as I could, but then you realise it’s fun to play guitar and reach new horizons but I really love playing for Mikael’s compositions. He gives me the platform to try new things and branch out with the types of styles that are on Opeth albums. MI: Personally, Opeth has had a huge impact on me; there’s always a record to help me with whatever mood I’m in and the bands associated with and referenced by Opeth have become some of my favourites too. Fans like me come out in droves worldwide to see you guys, so what is Opeth? 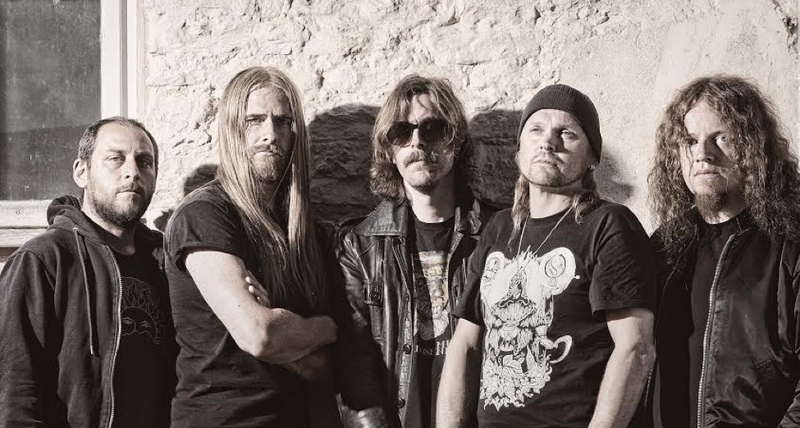 What makes Opeth what it is? Fredrik: That’s a tough one! It’s kind of for the listeners to decide. For us, we are the main filters. If we want to do something, and we think it’s good, which is a very important stage, then that’s all we can do. I think one of the reasons that we are so successful is that we play for real. We don’t use machines live, or click tracks. We are all about the music, and we wouldn’t put out an album unless we were really happy with it. It’s important for us that we don’t let it become an industry. The music industry is a big machine in a way but our music has to pass certain filters before we can do it. That’s very important for Mikael; if the right feeling isn’t there he won’t release the music. Maybe that’s one of the reasons? Also, we’re just trying to get better and better. Everybody is playing more individually and the more we play live shows the better we become as a band. Mike said it on the last tour actually, he has never thought the band is in as good a shape playing wise, which is of course great to hear. I think it’s a difficult thing to sum up why Opeth have had success, it’s most definitely in the ear of the beholder.